“Wellbeing”. What do you picture? Quite right. And that may be your view, but what about the next person? How to define the vague and varied world of wellbeing has been a million, trillion, maybe even squillion, dollar question that many professionals and politicians have been trying to crack. But it’s like looking at an optical illusion. It’s subjective, and everybody knows it. Yet the Scottish Government’s dogged attempts would try to suggest otherwise. The UK Supreme Court commented in para. 16 of its Named Person judgment that “‘Wellbeing’ is not defined” in the legislation. And the judges said the SHANARRI ‘wellbeing’ indicators found in the Named Person guidance “are not themselves defined, and in some cases are notably vague”. John Swinney’s “three month period of intense engagement”, was supposed to help the Deputy First Minister listen to concerns about the Named Person scheme. And what did many groups highlight? You guessed it. The difficulty with understanding what constituted a wellbeing concern. The Scottish Council of Independent Schools said that while the thresholds for child protection were clear, “early signs of concern about wellbeing less clear and prevention is not at the Data Protection Act level”. The Medical Practitioners Unions/Professional Groups expressed a need for “clarity about what constitutes a wellbeing concern… to distinguish it from a ‘minor concern’ about child neglect”. This is not a new concern. Many groups have been raising the issue of wellbeing for many years. Let’s hope the Scottish Government will listen this time. If someone had set out to make a video demonstrating how the Named Person marginalises families, they could not have done a better job than this training video from Angus Council. It’s designed to help professionals think about child’s planning meetings. If you have the stamina you can watch the 30 minute video in full but we’ve provided a few clips below. No doubt the video deliberately portrays some bad practice, which professionals are meant to spot. But you can’t help feeling that it reveals more than the makers intended about the inherent problems of Named Persons. It’s almost as if they want to show how awful the whole thing is. In a room full of strangers talking GIRFEC and SHANARRI jargon, the Named Person thanks the mother for attending as if she’s just another agency. It seems mum has not been meeting national standards for parenting. But the professionals are too busy, too stressed, and too under-trained to do anything more than go over checklists. Instead of getting help, mum gets a child’s plan meeting to make her more aware of her deficiencies. The video is a dramatised meeting. It begins with a headteacher saying hello to all those in attendance. She is the child’s Named Person. As we all know, the new law gives her power to speak to the child, including about very personal issues, and provide information or advice, and obtain and share confidential information on the family – all without requiring consent. The headteacher refers to GIRFEC, Getting it Right for Every Child, a national policy. Under the Named Person scheme, professionals are supposed to use GIRFEC to measure a child’s ‘wellbeing’. They do this by referring to eight SHANARRI ‘wellbeing’ indicators: “safe, healthy, achieving, nurtured, active, respected, responsible and included”. If this sounds confusing, that’s because it is. 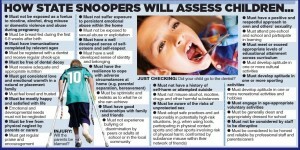 A child’s ‘wellbeing’ will be monitored using a whole range of strange graphics. Guidance on implementing the scheme includes a ‘National Practice Model’, which has been drawn up using a series of diagrams called the ‘Wellbeing Wheel’, the ‘My World Triangle’ and the ‘Resilience Matrix’. In total, teachers and health visitors will need a working knowledge of 221 risk indicators and 308 ‘wellbeing’ indicators. The headteacher/Named Person in the video is shown fumbling with a huge copy of the matrix. According to the video, teachers could also be responsible for filling out new ‘wellbeing web’ forms, potentially for dozens of children, before passing them on to a Named Person. People don’t like the Named Person scheme because it undermines parents. The video shows how alone the parent is in these situations. An array of professionals and practitioners, who are probably mostly complete strangers, are discussing the family’s very personal and private matters. It’s intimidating and humiliating. How difficult would it be for a parent to voice a different perception of the problem at one of these meetings? Or to say they don’t accept all of the concerns the practitioners have? Or even to refuse to consent? Families are concerned that the Named Person scheme will lead to an invasion of their privacy, with data being passed from agency to agency. This has been one of the biggest issues since the scheme was first announced. Notice how the mum’s mental health worker says: “A lot of the information is sensitive. I just can’t discuss it”. And then she proceeds to talk about it anyway. We all understand the challenges faced by councils trying to help families, both those who ask for help, and those who need it but won’t accept it. But the Named Person scheme with its all-pervading SHANARRI indicators, is not the answer. This video shows why. It’s a ‘how not to do it’ video. But is it even possible to make a video that would make this whole cumbersome, jargon-ridden, patronising policy look or feel any better than this? Does anyone actually know what ‘wellbeing’ means? The word ‘wellbeing’ is a nice word. You’ll hear it mentioned nearly every time someone talks about the Named Person scheme. That’s because ‘improving a child’s wellbeing’ is THE central concept of the Government’s plan. Politicians have decided this is a foolproof master stroke of conceptual simplicity. They love it. Yet parents across Scotland are raising serious concerns. Here are some reasons why the word ‘wellbeing’ is causing a stir. From August 2016, every child in Scotland will be appointed a Named Person to oversee their wellbeing. The trouble is, a Government-funded leaflet says “wellbeing is another word for how happy you are”. Elsewhere the Scottish Government say it can mean “a wider vision of happiness”. How can the state monitor the happiness of every child? The same guide says a Named Person will check that a child is respected, which includes being given a say in what they watch on TV and how their room is decorated. Wellbeing is highly subjective. The Scottish Parent Teacher Council warned that there could be potential disagreement between Named Persons and parents over what’s best for a child. – A so-called ‘National Practice Model’ has been drawn up using a series of diagrams called the ‘Wellbeing Wheel’, the ‘My World Triangle’ and the ‘Resilience Matrix’. 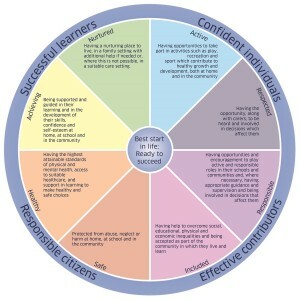 – The ‘Wellbeing Wheel’ is to be used to examine eight ‘key’ aspects of every child’s life, known as the ‘SHANARRI‘ indicators: Safe, Healthy, Achieving, Nurtured, Active, Respected, Responsible, and Included. – In total, teachers and health visitors will need a working knowledge of 221 risk indicators and 308 wellbeing indicators. When Stewart Maxwell MSP was asked to define wellbeing, he berated his interrogator for asking such a “ridiculous” question – but he still wasn’t able to answer it. And yet, Named Persons will be able to act on wellbeing concerns as they consider best. This means state officials will have the power to speak to your child, including about very personal issues, and provide information or advice – all without requiring your consent. In fact the entire Named Person scheme is predicated upon the understanding that information on ‘less critical concerns’ about a child’s wellbeing must be shared. One piece of Government guidance even says a Named Person has “responsibility for overall monitoring of the child’s wellbeing and outcomes”. Surely this is the role of a parent? Let’s not forget that the current threshold for information sharing is “risk of significant harm”. Yet the Information Commissioner’s Office says the Named Person law is “lowering that trigger down to wellbeing”. The idea that a scheme so controversial should hinge on a word so vague is bizarre and alarming in equal measure. No wonder so many parents are saying ‘No’ to Named Persons. The Government is responding to massive public opposition to the Named Person with pamphlets trying to explain the scheme. But the harder they try, the more confused they become. 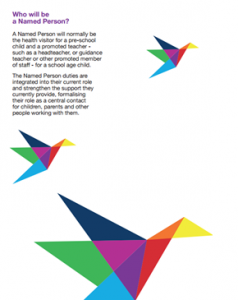 The most recent leaflet is called Named Person: Supporting children, young people and parents and, to be fair, we do quite like its use of origami bird graphics. But the actual content (i.e. the important stuff) is unlikely to allay the fears of genuinely concerned parents. • The leaflet explains that, from August 2016, every child in Scotland will be appointed a Named Person. • It says there is “no obligation” on families to use the Named Person. Yet everybody knows the scheme is compulsory. All children will have a Named Person by law. It will be implemented regardless of whether or not there is any need for state intervention. And the authorities will be able to collate and share data on you and your children without your knowledge, let alone your consent. 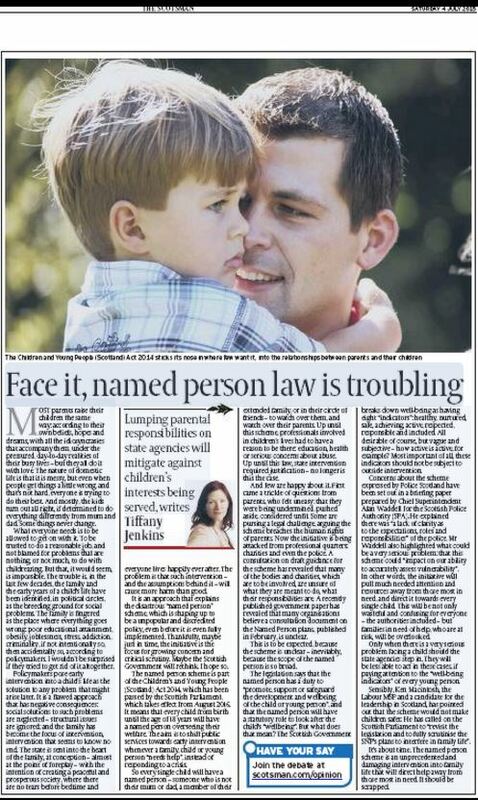 • Elsewhere, it says Named Persons have “no new legal powers to compel parents…to accept advice, support or help”. In reality of course, if mums and dads refuse to engage with the scheme, they will inevitably find themselves under scrutiny. Separate Government guidance even lists “parental resistance” as a “risk indicator”. • The leaflet refers to ‘wellbeing’ over ten times. 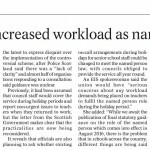 This is because a Named Person will be tasked with looking after a child’s ‘wellbeing’. It sounds nice. But other guidance says “wellbeing is another word for how happy you are”. How can the state monitor the happiness of every child? 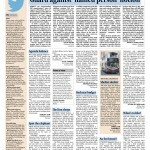 • The leaflet claims that the new law and supporting documents provide “a clear set of steps for practitioners”. Yet the guidance on implementing the scheme is littered with strange graphics. 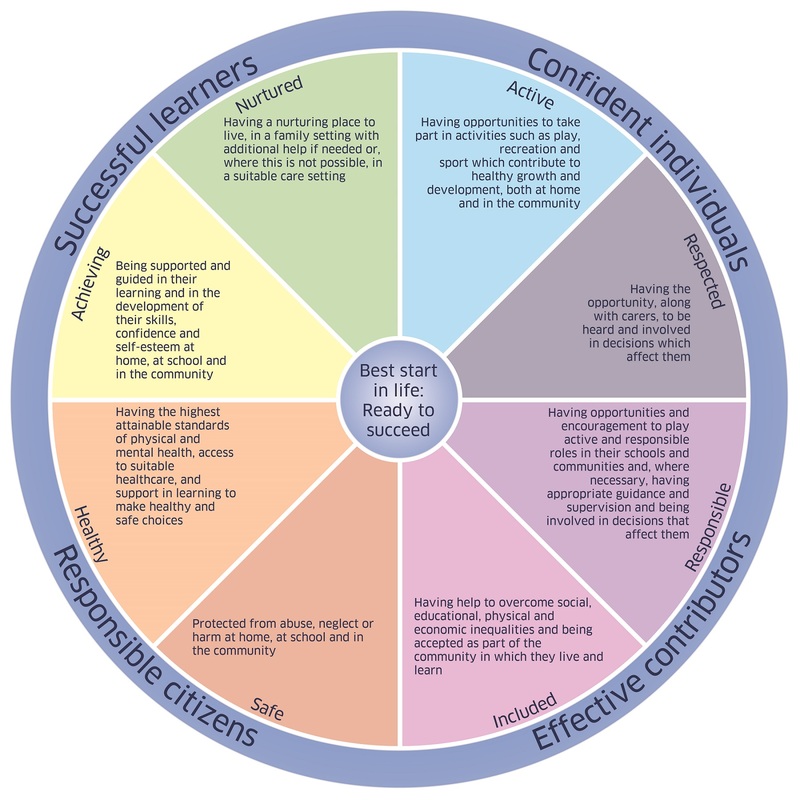 – The ‘Wellbeing Wheel’ is to be used to examine eight ‘key’ aspects of every child’s life, known as the ‘SHANARRI’ indicators: Safe, Healthy, Achieving, Nurtured, Active, Respected, Responsible, and Included. – In total, teachers and health visitors will need a working knowledge of 221 risk indicators and 308 ‘wellbeing’ indicators. • The leaflet refers to “the needs of vulnerable children and families”. Yet the Named Person law says nothing about vulnerability. Appointing a Named Person to every child, regardless of need, will further overstretch resources. Those that really need help will be more likely to be missed. • In explaining the role of Named Persons, the leaflet gives the example of “a health visitor [asking] for help from a speech and language therapist”. This seems innocuous enough. But why should parents have to rely on a Named Person to agree that their child should get a service? • It assures us that families will “in most circumstances” know when confidential information is being shared. This may be the biggest falsehood in the entire document. – The concept of parental consent appears absolutely nowhere in the legislation. – The Information Commissioner’s Office suggests data protection law should not be seen as an obstacle to data sharing. – NHS documents endorse widespread sharing of data on children and adults. – And guidance to health visitors actively discourages them from seeking consent for data sharing. • Currently information can be shared without a child’s consent if there is a ‘risk of significant harm’ to a child. But under the Named Person scheme information can be shared if there is simply concern for a child’s ‘wellbeing’. So why does the leaflet specifically refer to “a concern for the safety of a child” when it comes to information sharing? It’s all just very confusing. No wonder so many parents are saying ‘No’ to Named Persons. 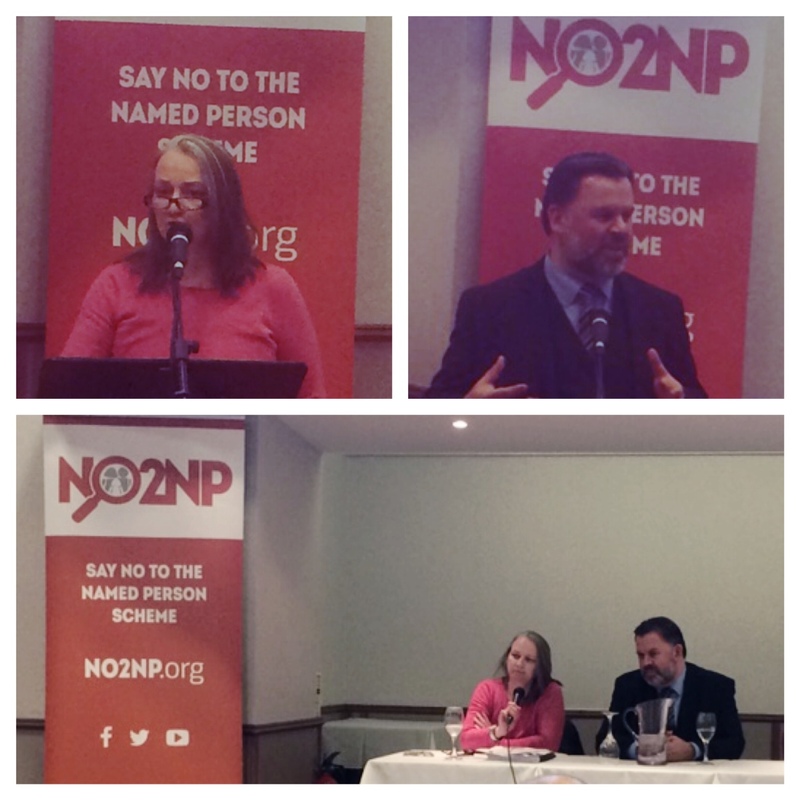 The latest stop for the NO2NP Roadshow on Tuesday night was the Pitbauchlie House Hotel in Dunfermline, where a good number of local folk came out to listen to our panel of speakers share their concerns about the scheme. 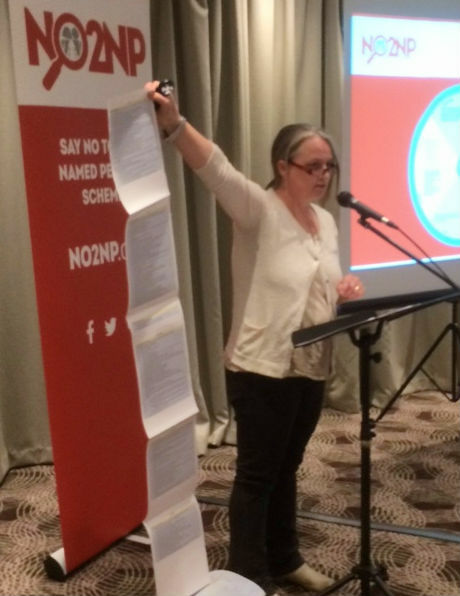 Liz then explained the passage of the Children and Young People (Scotland) Bill through Parliament and, while she had proposed around 40 amendments to it, Labour MSPs only supported her amendment to reduce the upper age limit for Named Persons from 18 down to 16. The SNP had whipped their MSPs to vote against all amendments, so they narrowly defeated that particular amendment by their Parliamentary majority. Despite having enthusiastically voted for the Named Person scheme, the MSPs in favour of it have now “gone very quiet”, she said. The full extent of its reach into families is only now becoming apparent, as schools and health visitors are starting to explain its ramifications. Liz finished by saying that the scheme was “dangerous, really dangerous” and urged everyone to spread the message of the NO2NP campaign as much as they could. Lesley went on to say that, while there is no accepted, universally used definition of ‘wellbeing’, if the Named Person’s statutory duties hinge upon assessing it, questions must arise over which definition will be used in practice. She then showed a video clip of an exchange in a recent Holyrood debate, where SNP MSP Stewart Maxwell was challenged to define ‘wellbeing’, but simply ridiculed the question and did not give any kind of answer! Gordon Macdonald from CARE then summarised the campaign’s three main objections to the Named Person scheme: it is universal and not in any way either optional or focussed on truly vulnerable children; the concepts of welfare and wellbeing are conflated, so that the scheme is about far more than identifying and helping vulnerable children; and the current threshold for sharing data without consent has been lowered from “strictly necessary” to “appropriate to fulfil the Named Person’s responsibilities”. Gordon went on to explain how the legislation had been an attempt to enshrine the principles of the United Nations Charter on the Rights of the Child (UNCRC), but that this had been done in a very selective way that omitted reference to the importance of parents and families for a child’s wellbeing. Gordon went on to say that the fact the final Bill had been a joining of a children’s services bill and a children’s rights bill was reflected in things like the SHANARRI indicators, where child protection issues (Safe, Healthy) were conflated with children’s rights issues (Respected, Included) and general wellbeing issues (Achieving, Nurtured, Active, Responsible). Nigel Kenny from The Christian Institute then shared some practical points, before an in depth Q&A, where mothers in the audience expressed outrage that this was happening and that parents were basically being kept in the dark about the true nature of the intrusive scheme. Several people signed up to be volunteers and we already have commitments to deliver thousands of NO2NP flyers around Dunfermline to get the message out. Thanks to everyone for helping us in this way! Around sixty locals turned out for the latest stop in Scottish Government Minister Alex Neil’s summer tour in Kilmarnock on Thursday. The lunchtime event was held in the town’s Centrestage Theatre and, in keeping with the venue, the opening item was a medley of traditional Scottish songs sung by a local male voice choir – not at all what those who had gathered were expecting. The bemused audience were further surprised when it became clear that Mr Neil would not be present for the “conversation” that was to take place during the meeting, but instead, local individuals noted questions from each table. Alex Neil returned after about 40 minutes to hear from each table the major concerns people had about community life in Scotland and what the Scottish government could do better. A retired businessman referred Mr Neil to the Scottish government’s publication, Creating A Fairer Scotland – What Matters To You? – a copy of which had been made available to everyone. 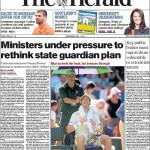 The publication states: “The vast majority of children starting primary school don’t show any signs of social, emotional or behavioural difficulties” and the businessman wanted to know why, given that frank admission, the Scottish government has appointed a guardian for every single child and young person until they are 18. 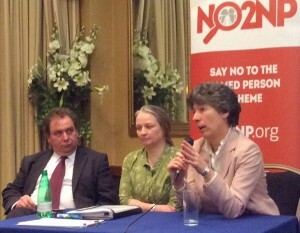 Mr Neil explained that the scheme was intended to identify the many children he claims have been abused but have not yet been identified (thereby treating every parent as a potential child abuser) and he believed parents would be consulted on who their child’s Named Person was going to be (even though there is nothing at all said about this in either the Act or the draft guidance). The Minister confirmed when pressed that there would definitely be a review of the legislation within a year or two of its coming into force in August 2016. At the end of the event, Mr Neil did finally address all those gathered and highlighted the many concerns he had heard raised about the Named Person scheme. He indicated that these would be “fed in” to the other feedback they were receiving from around the country and would hopefully be addressed in the coming days. The meeting was finished with a rendition by some local teenagers of the song from the Joseph musical Any Dream Will Do, but perhaps there should be added to the title “provided your Named Person considers it promotes your wellbeing”. Police Scotland has warned that the Named Person scheme could delay removing children from abusers because officials are spending time conducting ‘wellbeing’ assessments. 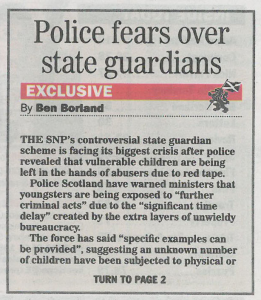 It was revealed at the weekend that Scotland’s police force is concerned that children could be the victim of “further criminal acts” caused by “significant time delay” created by the extra layers of unwieldy bureaucracy linked to the Named Person proposals. A NO2NP spokesman said a ministerial public statement is required “as soon as possible” to explain how many youngsters have been left in danger and for how long. The Police Scotland warning is contained in an official police submission on the guidance to how the Children and Young People (Scotland) Act 2014 will operate. 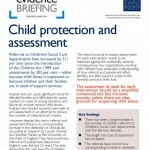 The submission states: “A potential risk has been identified that ‘wellbeing concern’ assessments are being carried out by a range of practitioners from organisations when there is actual information that a child has or is the victim of abuse and or neglect deemed as criminal acts. He added: “The allegations made by Police Scotland could not be more serious. Rather than speeding up help for abused and neglected children, the extra layers of bureaucracy significantly delayed the reporting of criminal acts against the youngsters. “‘Wellbeing’ assessments, which are at the heart of the entire Named Person scheme, have apparently caused delays that allowed abused children to be exposed to yet more abuse. “Named Persons, unlike social workers, are not experts in handling child abuse cases. It is unfair on teachers and health visitors to burden them with this responsibility. This statement from the police shows that involving non-experts in serious cases of abuse and neglect risks losing key evidence, allowing child abusers to avoid justice. “This damning piece of new evidence gives the lie to the Government’s main defence for the Named Person scheme. The incompetent Named Person policy will not protect abused and neglected children – it will expose them to even more danger. He continued: “The police offered the Government specific examples where following the Named Person policy actually delayed reports of child abuse and neglect. The public must be told immediately if the Government has asked for that evidence and if not, why not. “The minister must make a public statement at the earliest possible opportunity about any and all cases where Named Person pilot schemes have resulted in delays reporting child abuse and neglect. “This latest shocking development confirms that the Named Person policy is going to be a disaster: a disaster for abused and neglected children and a disaster for good Scottish families. “The time has come for the Government to admit it has made a huge mistake and scrap the whole scheme. Writing in the Sunday Express the Scottish Conservative Spokeswoman for Young People has warned that the Scottish Government’s Named Person plans “will not work”. Liz Smith MSP said many parents and professionals are likening it to “the totalitarian imagery in George Orwell’s famous book, 1984”. 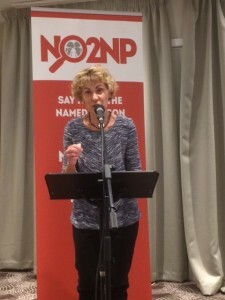 She acknowledged the Scottish Government’s motivation to tackle “appalling abuse which is suffered by some children”, but asserted that “you do not do that by insisting that all children between the ages of zero and 18 have a state guardian”, and branded the policy “both sinister and hugely misguided”. The article stated: “For a start, what is implicit in this proposal to have a Named Person for every child is the assumption that the state, rather than parents and families, has the primary obligation to look after children. That is entirely the wrong way round. She continued: “Secondly, by insisting every child has a Named Person, the Scottish Government will, by definition, dilute the resources which are available to help those children in genuine need. Is the Scottish Government really suggesting that an 18-year-old couple who are very successfully bringing up a toddler are in need of three Named Persons when there are some children out there who desperately need our help? “Little wonder that local authorities, who are already under considerable financial pressure, are throwing up their hands in horror at what this might mean for them”, she declared. 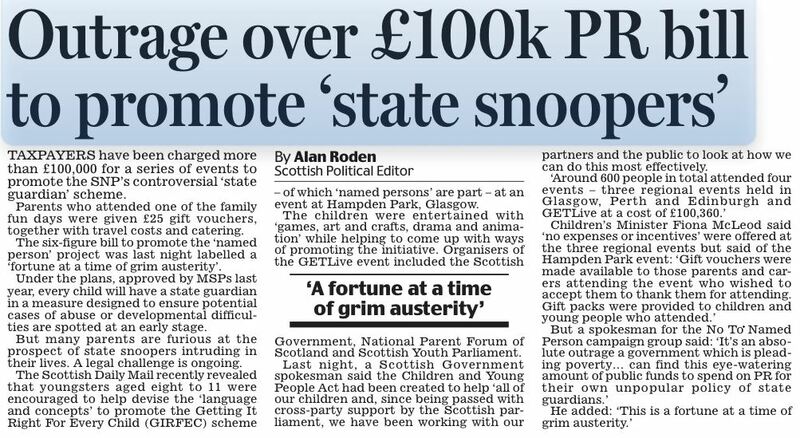 The MSP for Mid Scotland and Fife noted that the recent controversial Hampden event, where organisers were accused of bribing parents to turn up, was a recognition that the policy was in “big trouble” and an attempt to persuade parents that there was nothing to worry about. “So it is little wonder that large numbers of parents are starting to rebel and those who are supposed to operate and oversee the policy are voicing serious concerns. Whether it is the police, our lawyers, groups of teachers or health visitors, a number of professional bodies have said that they don’t think the scheme can really work in practice. Suggesting that better options were possible, she concluded: “The Named Person policy is intrusive, unnecessary and the accompanying guidance is nothing more than bureaucratic gobbledygook. “Perhaps this is why some MSPs, who initially backed the legislation, are now coming out of the woodwork, having second thoughts because they now understand the implications of this terrible legislation. “They can see the growing fury amongst parents who will simply not accept that they need to be told how to bring up their own children and they can recognise the alarm bells amongst professional organisations. Hugh Henry MSP for Renfrewshire South has become the latest voice to question the controversial Named Person scheme. Henry says he is concerned about overburdening schools which are not set up to take the extra workload, as well as the financial implications for councils. Henry said: “I do have concerns about the way in which the SNP government is introducing the Named Persons Policy. “There could be significant financial implications for councils and I am worried that children that have no need for a named person will have one imposed upon them. He added: “I fail to see how in large schools staff will have sufficient time or knowledge to make this work properly. “The Scottish Government should listen to parents and others who are calling for a rethink,” urged Henry. 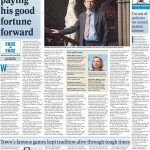 His comments are just the latest in a mounting chorus of criticism. In recent weeks concerns have been expressed by Police Scotland, EIS (the country’s largest teaching union), children’s panel members, sociologists, activists of all parties and newspaper editors. This is on top of the Law Society, the Faculty of Advocates, Child Clan Law, the Scottish Association of Social Workers, the British Association of Adoption and Fostering, the Church of Scotland, the Roman Catholic Church, the Scottish Parent Teacher Council and many others who have been expressing concerns for some time. A recent study into child protection strategies revealed that a rise in referrals did not result in a matching rise in detected cases of child abuse. Researchers from Bristol Law School at the University of the West of England (UWE) said they found a “311 percent increase in referrals over the 22 years studied, but no corresponding increase in the detection of child abuse”. But according to the research, the growth in referrals has not seen a similar increase in the number of child abuse cases detected. Commenting on the figures from the 22-year study of referrals in England, the evidence briefing explained: “The data shows that the vast majority of families simply need support services – and many families do not even reach the support threshold. Even those supporting the Named Person scheme are failing to coherently answer basic queries about the plans. Speaking on BBC Radio Scotland, Alan Small, Chair of Fife Child Protection Committee, faced questions from presenter Kaye Adams about the catch-all, intrusive nature of the legislation. Attempting to defend the scheme, Small said people understand that “at times” families need somebody to turn to, but Adams pointed out that it is unclear to what extent the Named Person will have the power or inclination to interfere or pry into family life. When asked if a parent can hang up the phone on the Named Person and say they’re not interested, Small responded with an unconvincing “No. Er… Yes and No”. Hesitating, he said “it all needs to be taken into context with the needs of the child”. To which Small asserted that it would be public services and the Named Person who decide. Avoiding the question, Small instead spoke about “proportionality”, which he says is an important word to be used when discussing the scheme, but he was unable to explain what the word actually meant when pressed by Adams. A columnist for the Scottish Daily mail has written extensively on why the Named Person plans are unwise, unlawful and unfounded. He continued: “just one of the details that makes the named persons scheme such thoroughly bad law is how it ensnares every child in the country, not just those already known to be at risk or of which, in that weasel term, ‘social services are aware’. 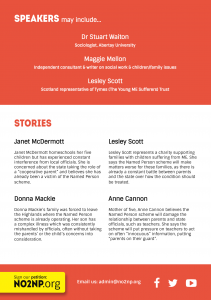 MacLeod also referred to a similar programme to Named Person which was launched on the Isle of Man in 2010 where, “the world and his wife were invited to report even the slightest concern to children’s social care”. He noted that: “It rapidly grew hard to retain or recruit staff as they buckled under a preposterous new workload. Families, meanwhile, resented needless intervention. 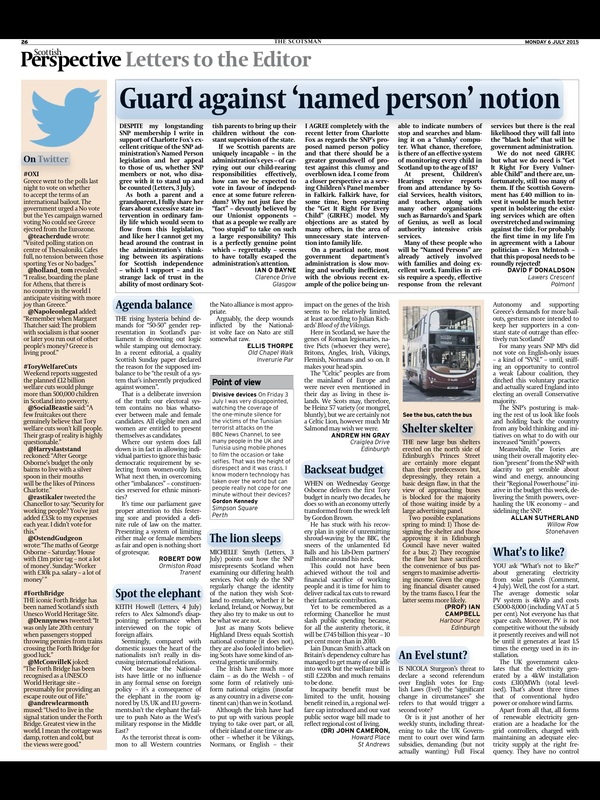 The columnist also drew attention to Article 8 of the European Convention on Human Rights which “asserts that citizens have a right to a “private and family life… the right to respect for his private and family life, his home and his correspondence”. Sociologist and Scotsman columnist Tiffany Jenkin has called for the Named Person scheme to be scrapped. She said: “Lumping parental responsibilities on state agencies will mitigate against children’s interests being served”. She said the assumptions behind this kind of approach “will cause more harm than good”. Commenting on the Named Person scheme, she warned: “So every single child will have a named person – someone who is not their mum or dad, a member of their extended family, or in their circle of friends – to watch over them, and watch over their parents. Herald Scotland social affairs correspondent, Stephen Naysmith, has described the Named Person scheme as “a presentational fiasco”. He also commented on the recently revealed consultation responses to the Government’s guidance on how the Named Person scheme would work in practice. Naysmith said: “The report on the Government’s guidelines was generous to a fault. For example it found 38% of organisations said examples in the guidance hadn’t been helpful, while 63% had. This is recorded as ‘in general, organisations found the examples… helpful’. 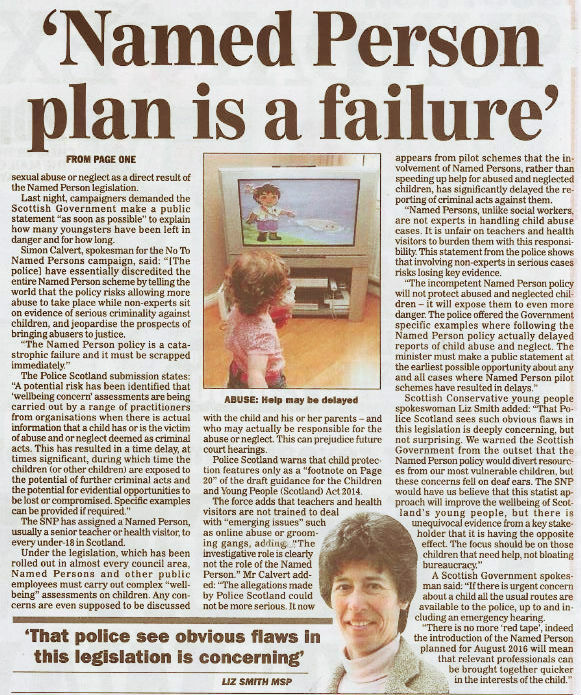 A Children’s Panel Member in Falkirk, which has been operating the ‘Getting It Right For Every Child’ (GIRFEC) approach for some time, has written to The Scotsman criticising the Named Person plans. “My objections are as stated by many others, in the area of unnecessary state intervention into family life”, wrote David Donaldson. He continued: “On a practical note, most government department’s administration is slow moving and woefully inefficient, with the obvious recent example of the police being unable to indicate numbers of stop and searches and blaming it on a “clunky’ computer. “What chance, therefore, is there of an effective system of monitoring every child in Scotland up to the age of 18? Donaldson raised concern that families in crisis, which “require a speedy, effective response from the relevant services”, will fall into the “black hole” of Government administration. He said: “At present, Children’s Hearings receive reports from and attendance by Social Services, health visitors, and teachers, along with many other organisations such as Barnardo’s and Spark of Genius, as well as local ¬authority intensive crisis services. “Many of these people who will be ‘Named Persons’ are already actively involved with families and doing excellent work. Families in crisis require a speedy, effective response from the relevant services but there is the real likelihood they will fall into the “black hole” that will be Government administration. He asserted: “We do not need GIRFEC but what we do need is ‘Get It Right For Every Vulnerable Child’ and there are, unfortunately, still too many of them. “If the Scottish Government has £40 million to invest it would be much better spent in bolstering the existing services which are often overstretched and swimming against the tide”. 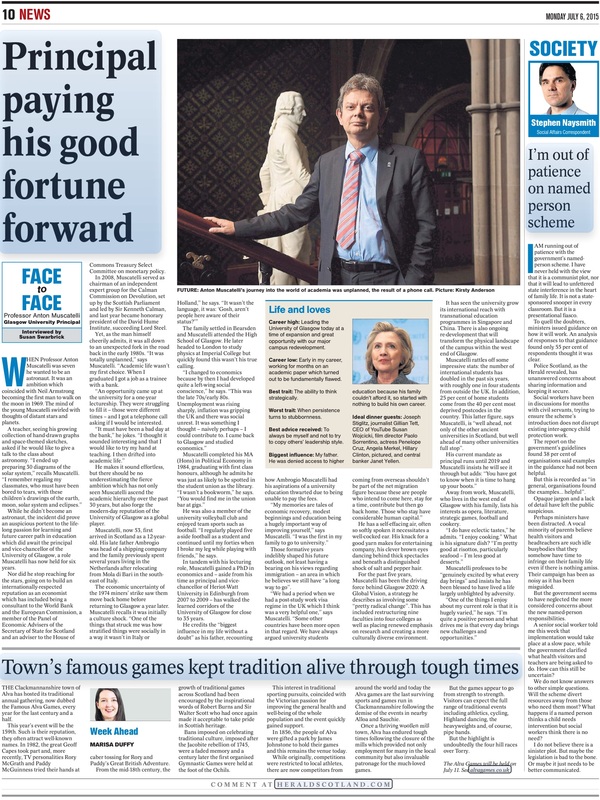 In a comment piece, the editor for the Scottish Daily Telegraph, Alan Cochrane, added his voice to criticism of the Named Person scheme. Referring to the plans, Cochrane said that the Scottish Government is “making a rod for its own back”. “That it deserves a caning there is absolutely no doubt whatsoever”, he added. Cochrane went on to criticise supporters of the Named Person scheme who write off parental concerns as “pure scare-mongering”. He said “that is unlikely to reassure many parents who object to the idea that some outside party, no matter their qualifications or good intentions, can have a say on the upbringing of their children”. He described the wide reaching plans as an example of “wrong-headed universality when what’s needed is specific and targeted action to protect those children who are most at risk”. Cochrane said that he suspects First Minister Nicola Sturgeon will soon have to “take a direct interest” in the plans. Pressure has been mounting on the Scottish Government’s Named Person scheme this week, with a succession of media stories reporting serious concerns about the plans. Callers have inundated the BBC with opposition to the Named Person scheme, as the Government is criticised for not knowing the reality of its own proposals. NO2NP spokesman Simon Calvert and Lesley Scott of ME children’s charity TYMES Trust – a supporter of NO2NP – also spoke out on BBC Radio Scotland on Thursday. 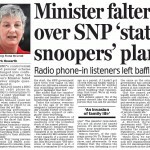 One caller told Kaye Adams that the scheme would undermine the family and “smacks of Big Brother”. In the words of another concerned caller, if finding vulnerable children is like looking for a needle in a haystack, the Named Person plans are like making the haystack bigger. The fact that parents will have no choice as to whether their children have a Named Person was highlighted by yet another caller. The Daily Mail criticised Fiona McLeod’s appearance on the show, saying she “failed to answer simple questions” about the plans. Speaking after the programme, a spokesman for NO2NP said: “It was striking that the scheme the Minister was defending is not the same as the scheme her Government has actually legislated for. 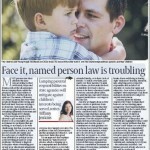 “She thinks the Named Person is just someone parents and kids can ask for help. “But the Named Person is legally empowered to monitor parents and children, to share their confidential data, and to put services in place, all without parental consent and even in defiance of parental wishes. “The Government actually put out a leaflet for parents saying the Named Person is there to monitor children’s happiness. “It said this means the Named Person will check ‘Your child gets a say in things like how their room is decorated and what to watch on TV’, ‘You trust your child to do the right thing’. This is an outrageous invasion of private family life. “If you give a government official the duties of a parent, they will act like a parent. They will escalate issues that should be left to parents. “Social workers desks are going to be overflowing with reports from Named Persons of all kinds of tittle tattle that should be beneath their notice. Ken Macintosh MSP, who is a father of six, says the Named Person scheme will put the most vulnerable children at further risk. Adding his voice to mounting criticism of the legislation Macintosh said the scheme will make it “harder” to help children who are most vulnerable. “My biggest worry is that this measure will take the focus of social workers and other practitioners away from at-risk children, which will ultimately make it harder to monitor and support those who really do need this kind of involvement”, said Macintosh, who is a Scottish Labour Leadership candidate. “I am certainly not going to lay claim to being a perfect parent, but is this really the best use of taxpayers’ money and teachers’ time? He added: “The national news is filled too often by stories of neglect and abuse, and the all too horrific consequences with children dying at the hands of their own parents. “At the same time, it is difficult to see how appointing a Named Person to look after for example each of my six children will do anything to improve child protection or to prevent such deaths occurring again. Around ninety parents, children and young people gathered at Hampden Park in Glasgow last Saturday to hear the Scottish government explain what their ‘named person’ scheme is all about. The wheels appear to have fallen off the PR wagon though, as parent after parent took Phil Raines, Head of the Scottish Government’s Child Protection Policy Team, by surprise with their ‘off-message’ feedback. •	Why had the Government ploughed ahead with this scheme given the opposition? •	Why there had been no consultations with parents before now? •	Why was Highland Council‘s Bill Alexander’s word accepted on the success of the Pathfinder, when it had clearly not worked for many? 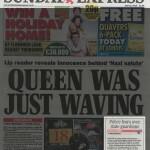 To his credit, Mr Raines accepted they had got it wrong and there was a lot more they need to think about. But if he thought his attempt to dress up GIRFEC as being about support, not intervention (although the concept of “early intervention” is referred to frequently in the Government’s draft guidance), would put parent’s minds at rest, he was mistaken – the questions kept coming. •	How are the professionals involved going to be trained? •	How will they be taught to work together across agencies using a common language, particularly when they are currently so bad at it? Further questions were asked about the funding of the scheme and managing complaints. •	How will it be maintained? •	Where is the money coming from now? Where will it come from in the future? But there was no action plan for the future in terms of funding – not even a plan for a plan! •	How will a Named Person and any complaints against them be reviewed and monitored and who will do the monitoring? •	Who will train the monitors? 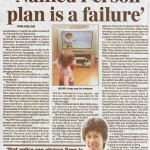 •	Where do families fit in when there is a breakdown between the monitor and the Named Person? Lots of good questions, but no answers except: “we have to re-think; we have realised it’s a larger issue than we had thought”. But these determined parents weren’t finished yet. They insisted that no local authority should launch or roll-out any aspect of the scheme on their own timetable. There must be only one launch date, the programmes already being rolled out by authorities such as Perth & Kinross and Forth Valley, must be pushed back. Everyone must stop the roll out until parental agreement has been reached – it can’t be launched before that. By this time the ‘ideas’ board at the front had so many post-it notes on it, they were falling off! No wonder it will be three months or more before they write all this up for the participants. Next it was the turn of the GIRFEC Guide, distributed to delegates before the event, to get short shrift. You may recall from a previous NO2NP blog that this is the information pack which stated that the named person would ensure that children have “what they need to have a good life”, including a say in how their bedroom is decorated and what they watch on TV. Several parents were extremely angry as they pointed out that the illustration for a ‘safe place’ in the guide of a modern, semi-detached two-storey home did not reflect the reality for many. Was the Government saying that those parents who brought up their children on the 14th floor of a tower block were not providing a safe place for their children? How, they asked, could such a broad statement about what a ‘safe’ place was go out to parents? 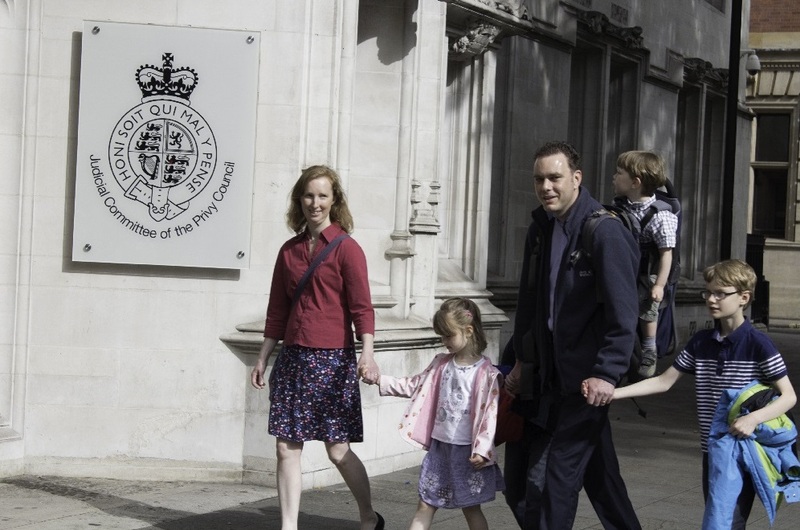 How will a named person be expected to judge a family as being in a ‘safe’ place? How realistic is it to define ‘safe’ or ‘happy’ or ‘feel good’ anyway. Answer? ‘We’ll go back and look at the imaging being used’. In other words – we’ll do some window dressing rather than sort out the real problem. And that was the recurring theme. At the end of the day parents were left with the clear impression that when it comes to GIRFEC there are plenty of questions but precious little in the way of answers. The Arran Suite at the Holiday Inn, East Kilbride, was filled to capacity for the latest NO2NP Roadshow event before the summer break. 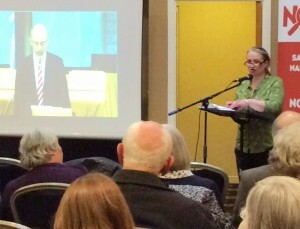 Community paediatrician Dr Jenny Cunningham told those gathered that concerns about the scheme were far more than questioning a different health model or budgeting constraints: it is about scrutinising families and undermining parental autonomy, which is the basis for a democratic society, she said. She went on to explain that the role of the community paediatrician has been redefined by this legislation. While previously 80% of her work was about various disabilities in children, and only 20% about vulnerable children, now 70-80% of her work has to do with assessing vulnerability through the SHANARRI ‘wellbeing’ indicators. SHANARRI stands for; safe, healthy, achieving, nurtured, active, respected, responsible and included. She finished by saying that she and many of her colleagues were very concerned about the new obligation to share confidential information. Next up was Lesley Scott of TYMES Trust, who said she had watched a video on South Lanarkshire Council’s website about young children and the importance of good attachment. Yet nothing was said about parents and children or families. Lesley went on to explain – and display – the 13 pages of “outcome signifiers” to wellbeing that the University of Edinburgh had drawn up. South Lanarkshire Council had also produced 398 pages of guidance for named persons and Lesley queried whether everyone would interpret it the same way. The guidance estimates that 20-30% of children and young people will require additional input from state agencies. Lesley expressed her concern that there is no facility for parents or children to disagree with the Named Person’s professional assessment of what is “needed” and parents will have no control over the ever-changing standard of parenting to which they will be held. There was a very lively and extended Q&A, where several people questioned whether Named Persons knew anything about the real world of parenting, especially when some of them may have no children of their own. 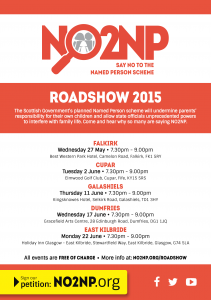 The NO2NP Roadshow will be taking a break for a few weeks over the summer, but do watch out for further events we have planned for later in the year! In the meantime, a big thank you to everyone who has come to these Roadshows – please continue to tell your friends about the campaign and encourage them to sign the petition. 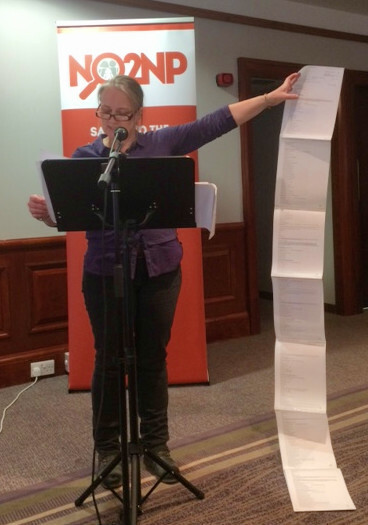 Lesley Scott showing 13 pages of “outcome signifiers” compiled by Edinburgh University. The latest addition to the Scottish Government’s parenting toolbox comes in the form of a tidy tick list. The one-size-fits-all Government guide to bringing up happy and healthy children was branded ‘sinister’ in the Mail On Sunday, which broke the news at the weekend. The paper reported that concerns may be raised over a child’s ‘well-being’ if it was found that a filling was required at the dentist, if the child was found to be disruptive at school, or if the child didn’t fancy helping with voluntary work. The checklist is part of the controversial Named Person scheme and designed to help the state official ‘monitor’ and ‘assess’ children as they grow up. Some other ‘indicators’ which could trigger an investigation involving social workers includes a child’s failure to display ‘positive attitudes to others’ sexuality’, failure by the child to display general optimism, or if he or she is seen to commit sporting fouls. This is a worryingly broad list of potential ‘indicators’, with a threshold so low and so vague that most ordinary parents could find themselves ‘under investigation’. Parenting cannot simply be made into a state-sanctioned formula or equation. Every family is different. Parents hold a diverse range of views determining what they believe is best for their children. And every child is unique, with their own gifts and temperaments. The majority of regular mums and dads recognise this and try to care for each child with a personal understanding that only loving parents can do. Parenting is so much more than a tick box exercise. 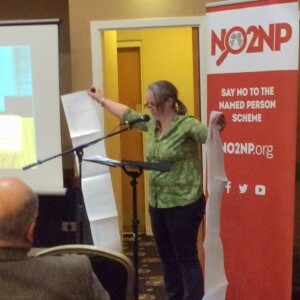 NO2NP supporter, Liz Smith MSP, said: “This checklist is a sinister example of how Named Persons would work. Some examples on the checklist simply cannot or should not be measured. 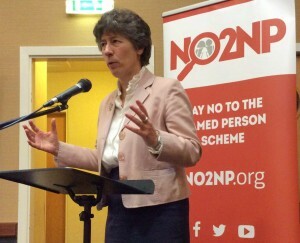 During a BBC Radio Scotland debate last week Lesley Scott of ME children’s charity TYMES Trust, a supporter of NO2NP, warned that the Scottish Government’s plan was about “empowering the Named Person to police the happiness of Scottish children”. Scott was debating Alex Cole-Hamilton, Head of Policy at children’s charity Aberlour and a proponent of the Named Person scheme. Cole-Hamilton failed to give a single example of how the Named Person scheme had made a positive impact when pressed by BBC presenter Kaye Adams. Referring to the Highlands pilot he responded saying there had been “some really good examples of this drawing the threads together”. Adams however said drawing the threads together was an “airy fairy expression” and asked for further clarification. She pressed Cole-Hamilton again, saying: “Give me a positive example of where this has made a child or a family’s life better? Cole-Hamilton again failed to provide a single example, but instead admitted it was about “prevention”. 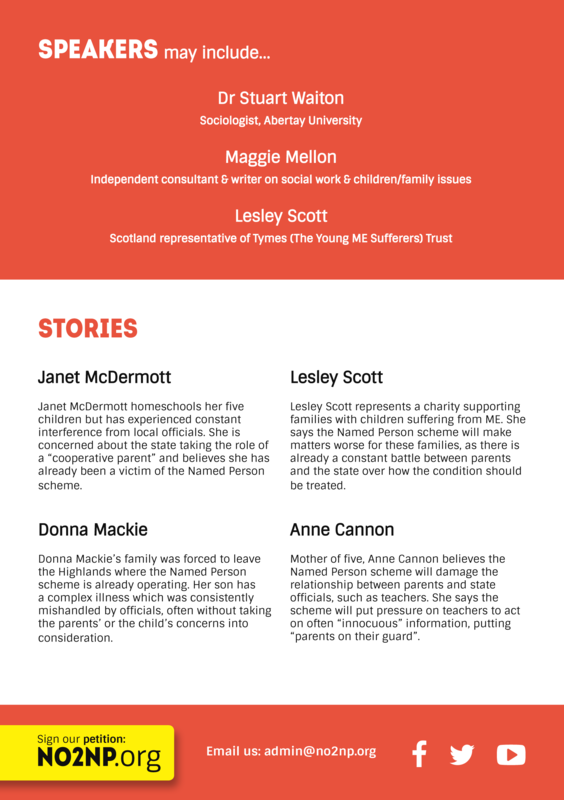 TYMES Trust’s Lesley Scott refuted Cole-Hamilton’s claims about the Named Person creating a single point of contact. She said parents already know who they need to go to if there is a problem, they already know who their child’s teacher, GP or health visitor is. These are all people who are already in place, she added. Scott explained that the Named Person can access and share confidential medical data and school records. 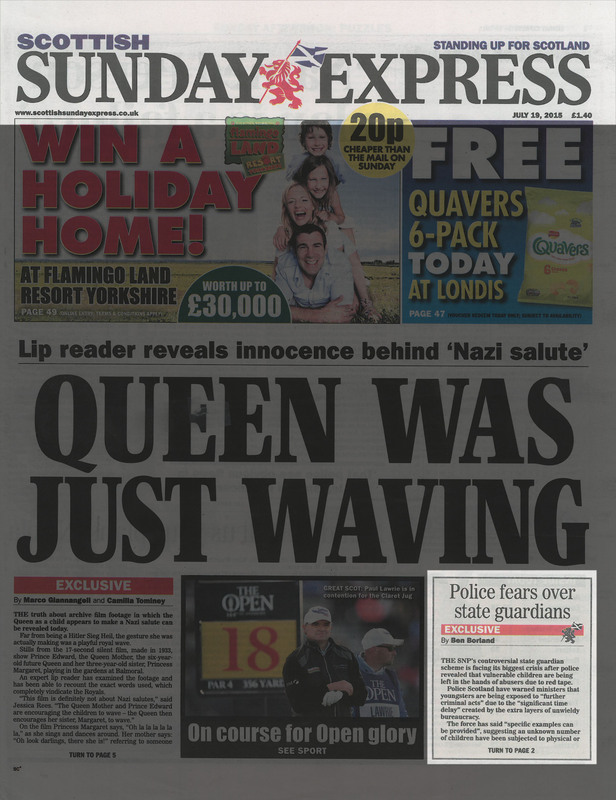 She continued: “They can question a child and give them advice, and supply services to them without the parents’ consent, and on the basis of what they think is most likely to make them happy”. Scott also pointed out that the scheme was not about identifying significant risk or harm but about wellbeing, which is “a lower, broader undefined threshold”. Scott also questioned how the scheme will work in practice. She raised concerns about the “enormous bureaucratic burden of the Named person” scheme on teachers and health visitors, who would be expected to administer the scheme, professions which she says are already at breaking point. She said looking for children at risk is like looking for a needle in a haystack but all the Named Person scheme is doing is making the haystack bigger. Last week’s appeal hearing rehearsed many concerning reasons why the Named Person scheme is not compatible with a free and democratic society, but perhaps the most revealing and worrying comment came from the Scottish Government’s QC. Pressed by Lord Malcolm on why every child needed to have a Named Person, when not all of them were at risk, Alistair Clark QC, representing the Scottish Government, stated that every child was deemed to be “potentially vulnerable”. Mr Clark’s words expose the thinking behind these intrusive plans. A NO2NP spokesman said: “The assumption that all Scottish children are potentially vulnerable is patronising to all ordinary parents trying to do their best to bring up their children. “The Scottish Government is saying to normal mums and dads that they all need the state to be a co-parent to stop them leaving their child potentially vulnerable. During the appeal hearing last week Aidan O’Neill QC, representing those bringing the legal challenge against the Named Person, addressed conflict between respect for the family and responsibility for the protection of children from harm. He said: “We accept there is a legitimate state interest in the protection of the vulnerable, but this is not just dealing with the vulnerable, it’s dealing with all children. Mr O’Neill pointed out that the Named Person scheme had been drawn up to promote children’s ‘wellbeing’ – a concept which, according to the Government, can include everything from mental health to a “wider vision of happiness”. He responded, “That’s what parents do and have done through the ages. It’s not the state’s job. Mr O’Neill raised the concern that the central assumption behind the scheme is that “the state knows best”. 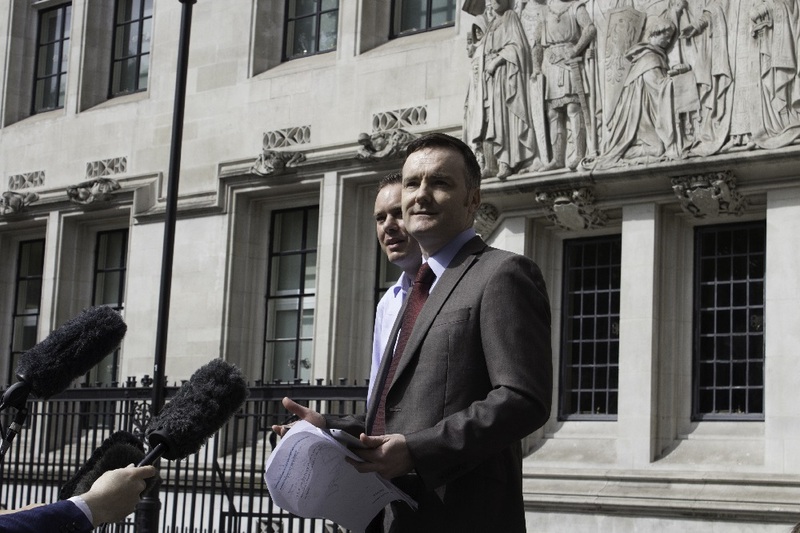 Yesterday, Aidan O’Neill QC, representing campaigners challenging the Named Person scheme, told Scotland’s highest court that the plan to give every child in Scotland a state guardian was “incompatible with the fundamental rights of a democratic society”. O’Neill, a leading human rights expert, said the scheme created a situation “worse than a nanny state because the nanny is at least responsible to the family”. He was speaking at the start of the appeal hearing by opponents of the Named Person legislation, after Lord Pentland rejected their initial bid last year. During the appeal, in Edinburgh’s Court of Session, Mr O’Neill said the state should support the family in the upbringing of children as the family is the fundamental group unit of the state and entitled to state protection. He said the Universal Declaration of Human Rights was written to counter Nazi and Fascist totalitarian states which placed value on “uniformity and conformity” and to point out that “the child is not the mere creature of the state”. He said the compulsory nature of the law and the need to collate data on every child would result in “white noise” meaning “those who do need help get lost”. He said the scheme was drawn up to promote ‘wellbeing’ (which can include everything from mental health to a “wider vision of happiness”) among children but said: “That’s what parents do and have done through the ages. It’s not the state’s job. “We accept there is a legitimate state interest in the protection of the vulnerable, but this is not just dealing with the vulnerable, it’s dealing with all children. He said the central assumption behind the scheme is that “the state knows best” whereas families “are the breeding ground of diversity and individuality”. 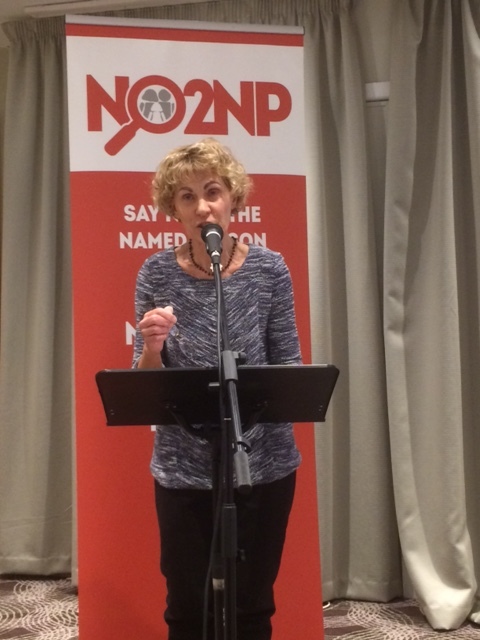 The legal action is being brought by The Christian Institute, CARE, TYMES Trust and the Family Education Trust, with the support of academics and individual parents, all of which support the NO2NP campaign. The appeal before Lord Carloway, Lord Malcolm and Lord Bracadale continues today with the Scottish Government’s response. The Named Person scheme is part of the Children and Young People (Scotland) Act and is expected to be implemented nationwide in 2016. 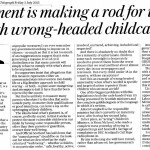 Graham Grant, Home Affairs Editor for the Scottish Daily Mail has written a stark warning against the Named Person scheme, branding it a “Stalinist blueprint for a happy childhood”. Commenting on recent remarks by Bob Fraser, the civil servant driving forward the Named Person scheme, he said: “It may have sounded at first like a calm explanation of a sensible policy. 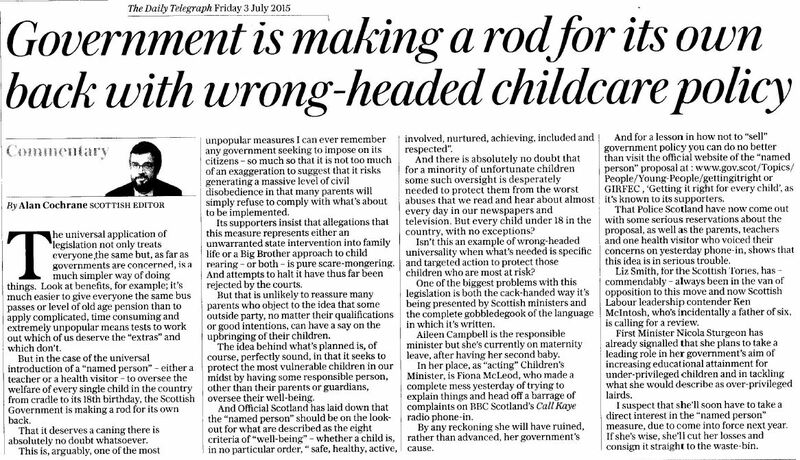 But, in reality, what was presented was a chilling manifesto for effectively outsourcing parenting to the state and to its legion of officials”. He continued: “In essence, government officials have been quietly drawing up guidelines for a happy childhood – a kind of Stalinist, state-endorsed blueprint for a healthy and contented upbringing, which must be adhered to at all costs. “This idea of compulsory compliance with a set of government-imposed ideals is, of course, a facet of totalitarian states, which rely on the micromanagement and strict regulation of private and family life. “The ‘enforcers’ are the named persons themselves – mainly health visitors and head teachers – who will log perceived deficiencies in the child, perhaps demanding confidential medical records to back up their concerns”. Fraser, the Getting it Right for Every Child health adviser in the Scottish Government’s Better Life Chances unit, suggested parents could be judged on how much they show their child ‘love, hope and spirituality’. Grant commented on this point stating: “By setting arbitrary yardsticks based on ‘love, hope and spirituality’ – which, in any event, may seem more appropriate for a New Age commune – the named persons hope to uncover ‘problems’ that previously did not exist. Grant also commented on the “scale of intrusion” the Named Person scheme poses warning that it is “far greater than most people realise”. He writes: “Pivotal to the smooth operation of the system is the free flow of personal information between public bodies. The named person can demand sensitive personal information, for example, from the NHS, if they believe the circumstances demand it. The top civil servant behind the Named Person scheme has suggested parents could be reported to state officials if judged to be showing their child inadequate levels of ‘love, hope and spirituality’. Bob Fraser, the Getting it Right for Every Child health adviser in the Scottish Government’s Better Life Chances unit, explained his latest thinking at a conference of childcare workers. He argued it was about all children and not just “the usual suspects” who are already known to social services. 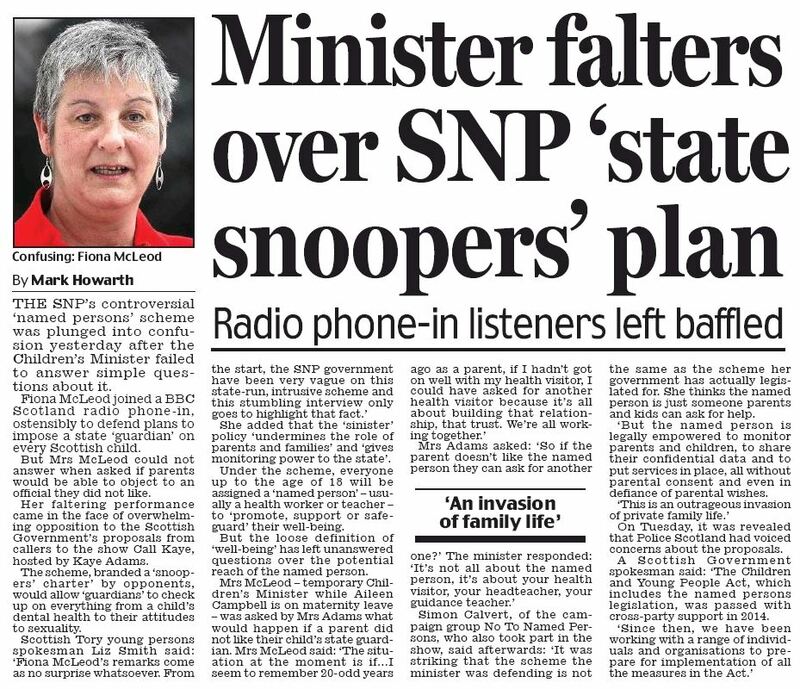 Liz Smith MSP, a vocal opponent of the plans, said: “This is exactly the sort of nonsense which critics of the named person scheme feared would happen. 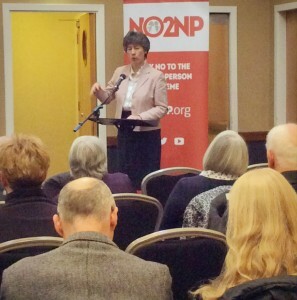 The campaign saw strong support in Elgin last night as concerned parents and individuals, with some traveling quite a distance, turned out for the latest NO2NP Roadshow. 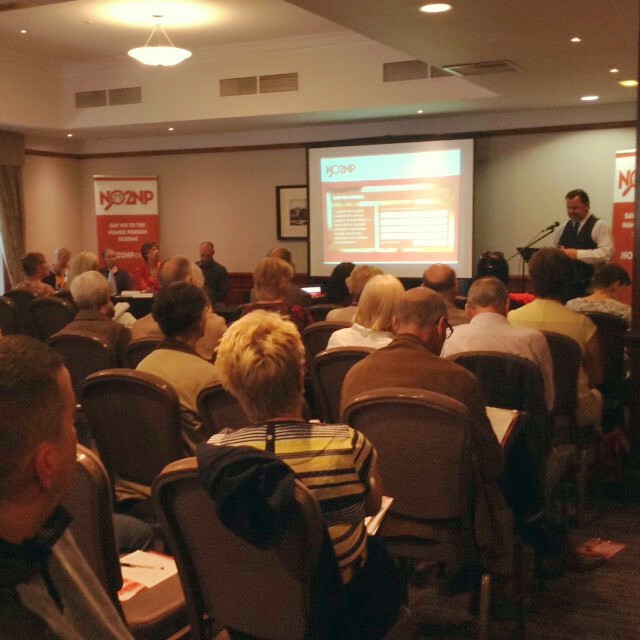 Nigel Kenny of The Christian Institute explained that the campaign was made up of a broad coalition of organisations and individuals from academia, charities, education, medicine, politics and social work. He said all those involved have a shared concern for the importance and autonomy of the family in raising the next generation. 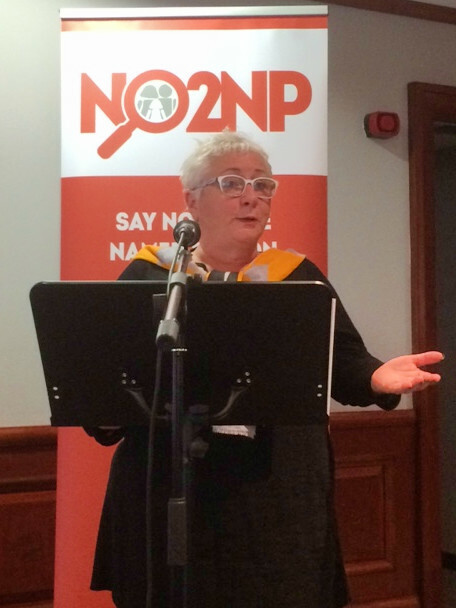 Videos were shown, the first explaining the background to the campaign, and the second from First Minister’s Questions last week, when NO2NP supporter Liz Smith MSP challenged Nicola Sturgeon over Clan (Community Law Advice Network) Childlaw’s concerns about data sharing. Lesley Scott from Tymes Trust then spoke about the blueprint for every child’s life that has been planned under the GIRFEC (Getting It Right For Every Child) model, including the Wellbeing Wheel, the My World Triangle and the Resilience Matrix. She pointed out that Edinburgh University had identified no fewer than 304 outcomes that could arise from the SHANARRI “wellbeing” indicators. Nigel finished off the talks with an update on the judicial review appeal (due to be heard in Edinburgh on 3rd and 4th June) and some tips on how people can get involved with the campaign. There was a lively and extended Q&A at the end, where people expressed their deep concerns about the negative impact that the scheme will have on families, schools and society at large. 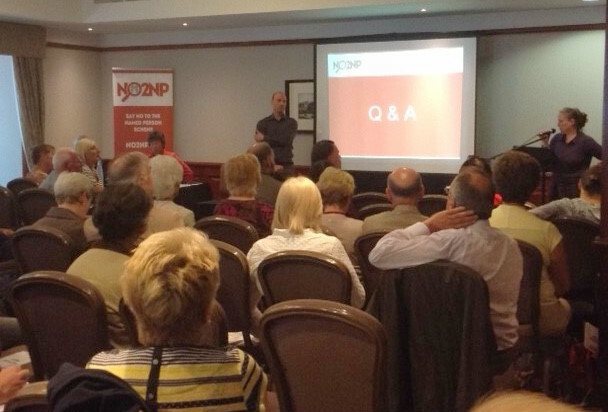 The NO2NP Roadshow will be stopping off at Falkirk next on Wednesday 27th May, when we’ll be at the Best Western Park Hotel in Camelon Road at 7.30pm. Hope to see you there if you live in and around the area! 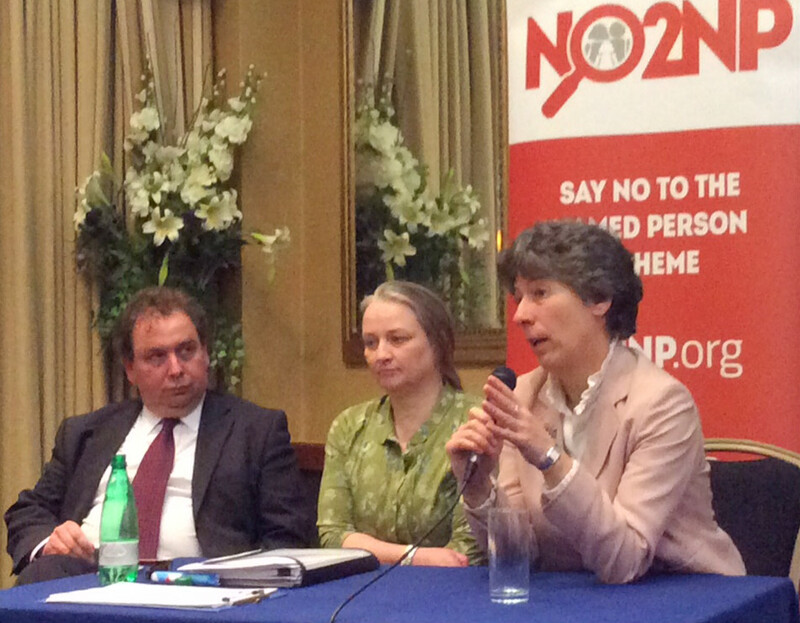 The latest NO2NP Roadshow event was held in the Aberdeen Arts Centre on Monday (11th May), where one local woman’s run in with an emanation of the Named Person scheme at her daughter’s school was raised during Q&A as a matter of concern. Even more concern was expressed when it was revealed that a GP would be obliged to share confidential patient details about, for example, a mother’s struggle with depression with her child’s Named Person. After a video was shown about the judicial review in the Court of Session, Abertay University sociology lecturer Dr Stuart Waiton spoke about the disjuncture between the people and the powerful and how, over the past century, children were no longer being seen in the context of their families and government was increasingly seeing its role as one of “risk management”. 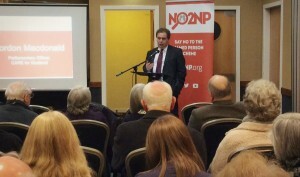 Some practical points on how people can be involved in helping the NO2NP campaign were then shared by Nigel Kenny of The Christian Institute, before a lively Q&A, always one of the high points of these Roadshows. 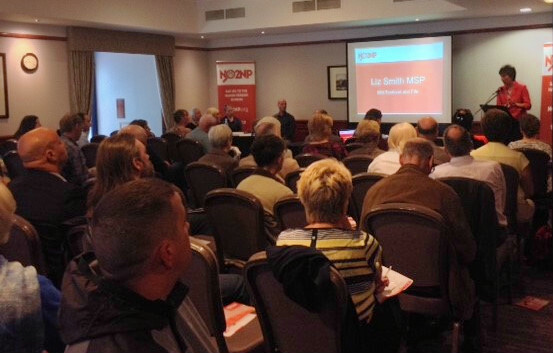 Our next event is in Elgin this coming Monday (18th May) at the Laighmoray Hotel, Maisondieu Road, Elgin, IV30 1QR at 7.30pm – please do come along and find out more about the campaign. The Scottish Government’s consultation on statutory guidance to accompany the Named Person scheme closes on Friday 1 May. The guidance was supposed to clarify and illuminate matters, but has somehow only managed to muddy the waters even more. It contains over 100 pages of impenetrable, incoherent and incomprehensible politically correct double speak. After looking through it, and even after taking legal advice, we are none the wiser as to how this scheme will work in practice. The responsibilities of a Named Person are going to fall on teachers and health visitors. These are hard-working professionals with massive conflicting demands on their time. How can they be expected to shoulder the additional burden of making crucial decisions which will impact on children and their parents? One thing is clear: the guidance confirms everything we’ve been saying about the Government’s plans. Parents are sidelined and face the prospect of confidential information being shared about them and their children without consent. “the Named Person should make it clear that whilst the views of the child and parents are valued and must be taken into account, their consent is not being sought, and the Named Person may, where appropriate, share information without consent”. NO2NP remains firmly of the view that the primary legislation itself is fundamentally flawed and cannot be corrected by guidance. 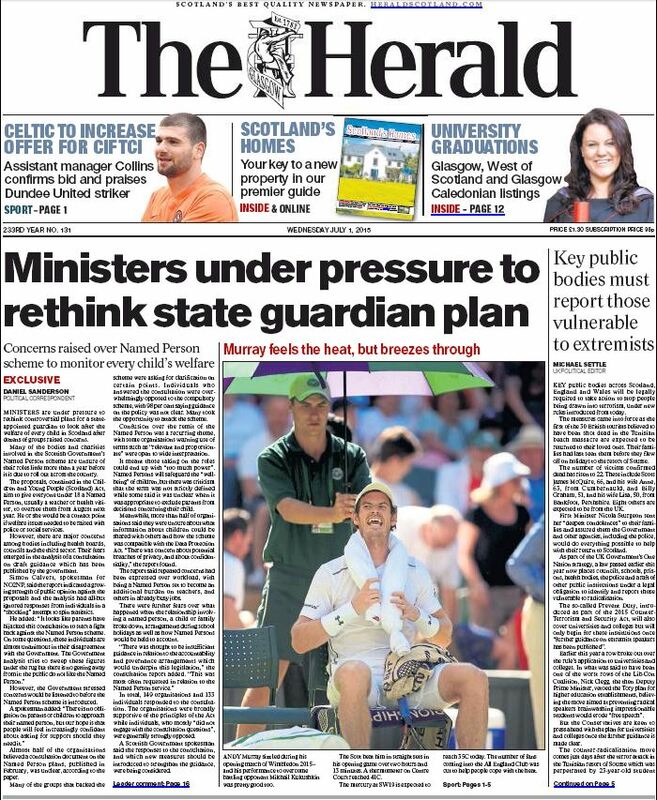 Nonetheless, it’s important that the Scottish Government hears what people in the real world think of their state guardian scheme. 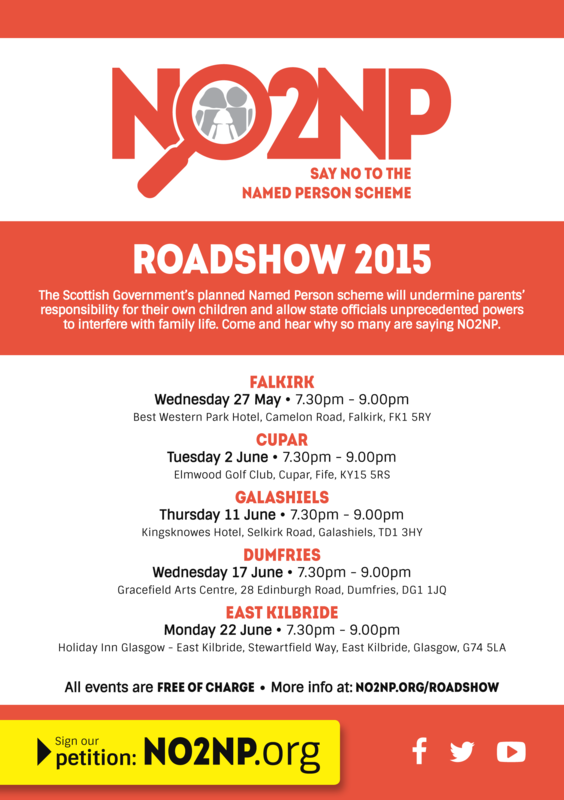 This consultation is another chance for us to say No to Named Persons. If you’re short on time, you might just want to respond to question 23, which invites general comments on the Named Person. For suggestions on the line you might want to take, check out the tips below. Please say NO2NP by responding to this consultation by 1 May. The guidance should be prefaced and punctuated by assurances that the Government recognises that parents are primarily responsible for their children, not the State. Paragraph 2.7.1 says that there’s a wellbeing need if a child’s wellbeing “is, or is at risk of, being adversely affected by any matter” (emphasis added). This is extremely vague and makes it almost inevitable that Named Persons will interfere in ordinary family life because the threshold of wellbeing is so low. The list of things the Named Person is supposed to have “a clear understanding of” (see para. 4.1.16) sounds like a lot to add to the job description of professionals who already have a full time job. Parents are repeatedly sidelined in the guidance. For example, according to paragraph 4.1.19: “The Named Person response to any wellbeing concerns should be proportionate, informed by the child’s views and should reflect the nature of their need for additional support” (emphasis added). What about parents’ views? ‘Information sharing’ is one of the greatest concerns because of the potential for breaches of privacy. Paragraph 10.2.14 suggests that parental concerns about information sharing could be ignored on almost any grounds. This is going even further than the legislation. 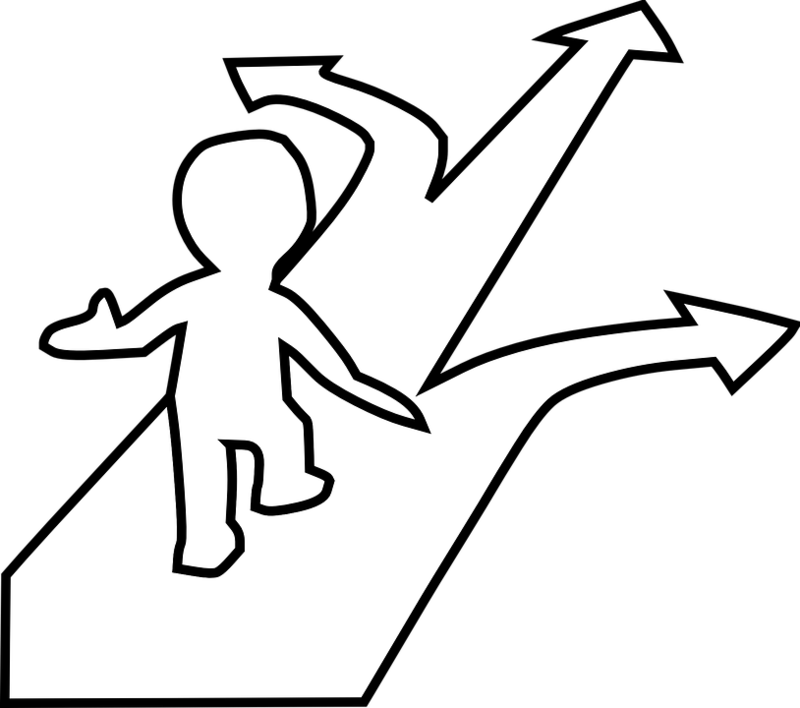 The guidance should set out in exactly what circumstances parents could be legitimately excluded from discussions about a child’s wellbeing – if any – instead of using vague generalities. Paragraph 10.2.19 says children or parents would only have to engage with the Named Person if “there is a current concern or a concern arises about the child’s wellbeing”. But the fear is that a refusal to engage with the Named Person will itself likely be deemed “a current concern”. Paragraph 10.3.5 gives virtual carte blanche to Named Persons to share information with other ‘service providers’: “if they consider it is relevant to the exercise of functions of the recipient which affect or may affect the wellbeing of the child or young person”. Guidance should stipulate safeguards to protect privacy, not open the door further to unnecessary data sharing. The Scottish Government has been accused of living in “cloud cuckoo land” after publishing a bizarre series of graphics in an attempt to show how the Named Person scheme will work. 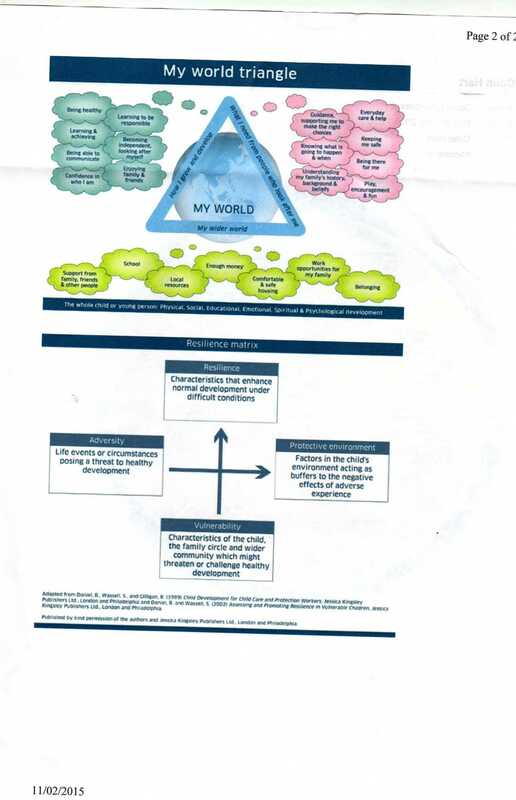 Official guidance on the scheme includes oddly-named diagrams such as the ‘Wellbeing Wheel’, the ‘My World Triangle’ and the ‘Resilience Matrix’, designed to be used by state officials to assess children up to the age of 18. The diagrams form part of a so-called ‘National Practice Model’, which is supposed to help teachers and health workers understand how to implement the scheme, but critics say it is littered with jargon. 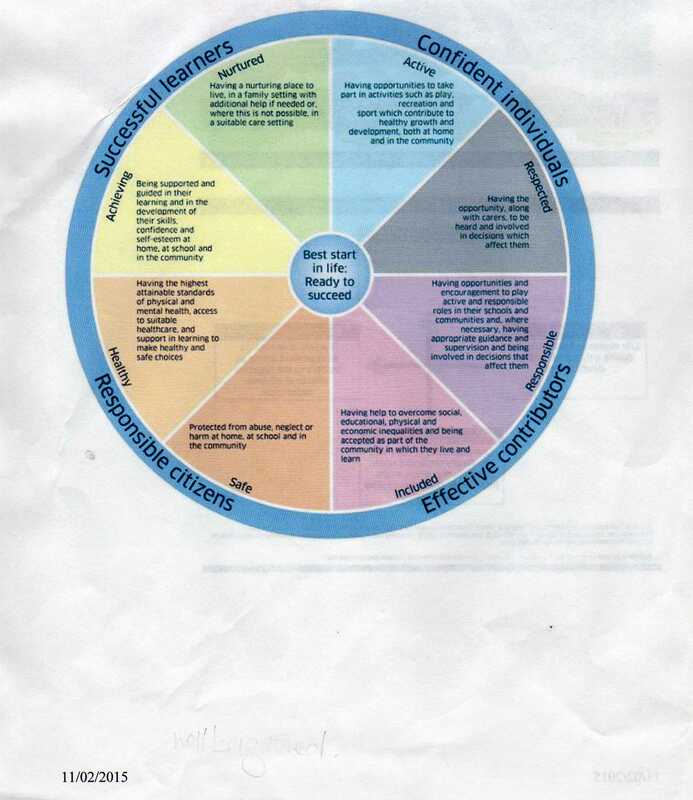 Central to the scheme is the ‘Wellbeing Wheel’ which is to be used to examine eight key aspects of every child’s life known as the “SHANARRI” indicators – Safe, Healthy, Achieving, Nurtured, Active, Respected, Responsible, Included. Changes to ‘improve’ the child or young person’s wellbeing are then decided based on the results of the wheel. Once the data has been recorded then officials can bring other diagrams and graphics into play. 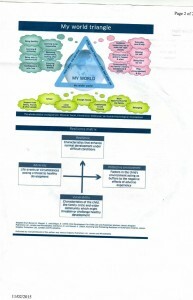 The My World Triangle is a graphic containing a series of clouds filled with key phrases and words designed to help gather further information about the needs of the child. This may include information about health or learning, offending behaviour or information about issues affecting parenting. The next diagram contains the peculiar Resilience Matrix graphic which is used to collect even more data about a young person and is supposed to help practitioners organise and analyse information. But in its own guidelines, the Scottish Government admits problems with the Resilience Matrix and states “its use within the National Practice Model has been the most difficult to understand”.